Download the Royal New Kent Golf Club mobile app to enhance your experience. Mobile apps contain many features like scorecard, GPS, tee times, news, deals and more! Click on the icons for more information and free download. Flowing across 7,372 yards of a windswept, rugged landscape, Royal New Kent has been called "the truest representation of an Irish links in America." Royal New Kent is reminiscent of the Irish Landscape where links courses such as Royal County Down and Ballybunion were built. 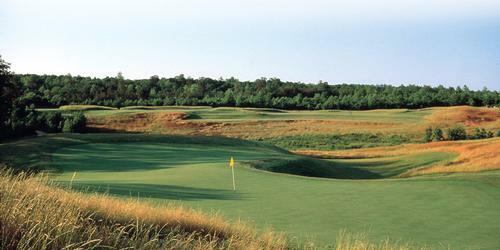 Greens hide behind sharp, grassy knolls, hand stacked rock walls and tall fescue grasses. The generous, countoured fairways occasionally demand blind shots. 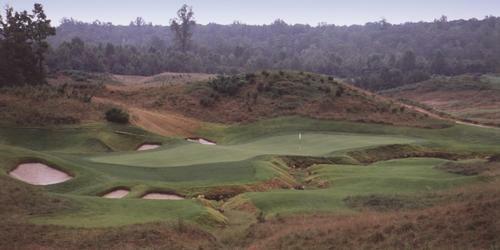 The par 72 design features over 120 bunkers, many are deep shadow bunkers lined with fescue grass. The enormous, fast greens have bold swales and ridges. Each hole offers several playing options. Please call 804-966-7023 for current rates. Call 804-966-7023 for rates and tee times. Contact Royal New Kent Golf Club at 804-966-7023 for more information and details on holding a golf outing at the course. Contact Royal New Kent Golf Club at 804-966-7023. Contact Royal New Kent Golf Club at 804-966-7023 for onsite or nearby dining options. This profile was last updated on 07/03/2018 and has been viewed 12,680 times.